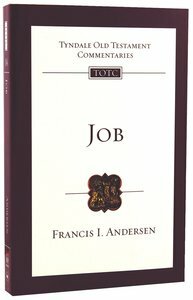 About "Job (Re-Formatted) (Tyndale Old Testament Commentary Re-issued/revised Series)"
Francis I. Andersen (Ph.D.,The Johns Hopkins University) taught Bible studies in the United States and other countries, and was David Allan Hubbard Professor of Old Testament at Fuller Theological Seminary before retiring. He is currently Professorial Fellow in the Department of Classics and Archaeology at the University of Melbourne, Australia. He has written major commentaries on Hosea, Amos, Habakkuk and Micah (Anchor Bible Commentary) and Jeremiah, as well as Job (Tyndale Old Testament Commentary). In all he has 43 volumes and over 90 papers published. He has made major contributions to the understanding of the Hebrew language and continues to work with Dean Forbes on a Hebrew Grammar that encapsulates 37 years of his research. The databank associated with this is now being purveyed by the LOGOS Corporation.